Now it is possible to create portable, lightweight, telescoping poles with carbon fiber tubes. Using high modulus carbon fiber tubes, longer telescoping pole lengths can be achieved that are stiffer and more manageable than aluminum poles. When compared with aluminum or fiberglass, the benefits of carbon fiber tubes for telescoping assemblies are tremendous. 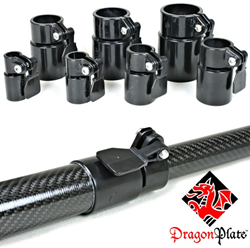 Dragonplate has recently released a telescoping tube clamp system that provides a strong, yet easy to use method for creating extendable carbon fiber tube assemblies. These telescoping tube clamps feature an adjustable screw to get the perfect fit for the sliding tube and a clamping lever that allows for quick adjustment of the pole length. The one-piece construction makes for easy assembly by simply bonding the carbon fiber tube into the lower half of the tube clamp and sliding the next smaller tube into the top half. When compared with aluminum or fiberglass, the benefits of carbon fiber tubes for telescoping assemblies are tremendous. Standard carbon fiber tubes are approximately the same stiffness as aluminum, but half the weight. The real benefit, however, comes when high modulus carbon fiber tubes are used. Dragonplate offers high modulus tubes that are stiffer than steel, yet still only half the weight of aluminum. The result is a telescoping tube set that is easy to handle, for example with microphone or camera boom arms, easy to setup, in the case of portable communications towers, and without worry of corrosion or warping over time. By applying these new telescoping tube clamps and high modulus tubes to camera arms, it is possible to make boom arms that are substantially longer than is possible with traditional materials. For example, whereas an aluminum boom may not be able to cantilever further than 10 or 15 feet without significant sagging, ultra high modulus carbon fiber telescoping arms can stretch 20 feet or more, yet are light enough to easily carry. Applications for this include inspection tools, tactical police and military cameras, and production studios. The high modulus carbon fiber tubes themselves are useful as direct replacements for just about any application where carbon fiber is appropriate, but additional weight savings or increased stiffness are required. At 3 times the stiffness of standard carbon fiber tubes, ultra high modulus carbon tubes offer the ultimate in stiffness and low weight options for just about any project ranging from industrial automation robotics to idler rollers to sporting goods.